Dress Code: Semi Casual - don't look skanky, people are trying to eat. 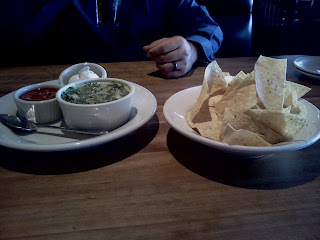 Recently I enjoyed a wonderful date night with my hubby at Hillstones. I have heard many wonderful things about it - food and ambiance wise. On our way there, I was looking around and wondering if we were even in the right area. A few streets before the restaurant can have you second guessing yourself. 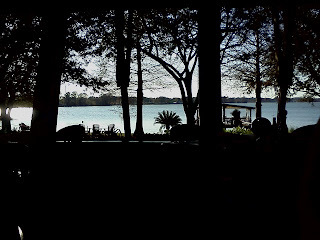 But all of a sudden there you are - sitting right on Lake Killarney - this modern, yet rustic beautiful restaurant that welcomes you in with the beautiful foliage, spectacular views and the scent of deliciousness in the air. The next thing I noticed was the complimentary valet parking. How awesome! We were there around 4pm, so it really wasn't busy so we parked ourselves. But, I have been told that later in the evening and on weekends it can be very busy and the valet parking makes it so easy to just go and enjoy yourself. We walked in and the building is BEAUTIFUL! Modern clean lines and large windows mixed with the rustic feel of exposed brick and wood - it all perfectly together to make it feel like you were going out to a fancy restaurant but was as comfy as slipping on a pair of slippers and eating a bowl of mac and cheese on the couch.We were seated at a booth that looked out onto the lake. 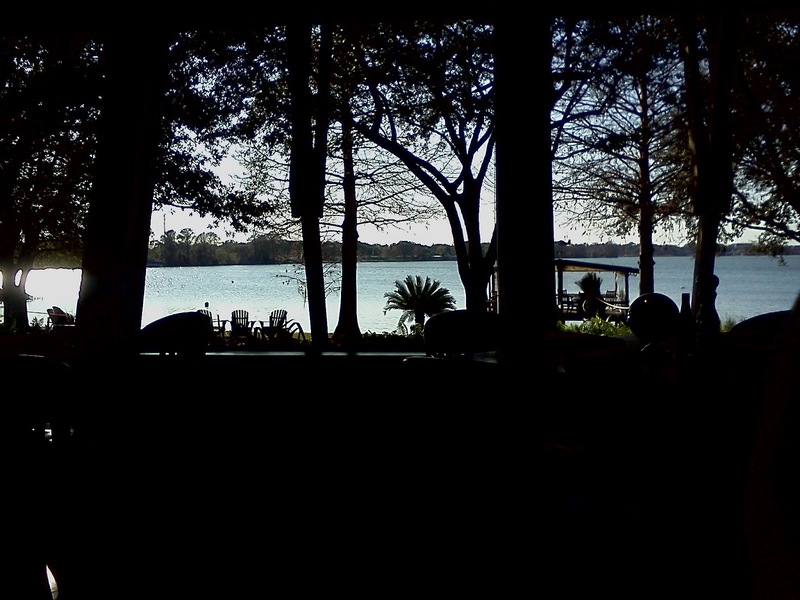 Gorgeous - I noticed the outdoor patio as well as groupings of Adirondack chairs with small tables, and a covered deck on the water with more chairs and tables. Turns out - when it is warmer (or if you like it chilly) you can sit outside on the lawn or over the water and enjoy the scenery or a romantic sunset with a bottle of wine and some food. How cool! The hostess in front was very cheerful and nice. Big genuine smiles always win me over. We had made a reservation - although it was not busy at the time - better safe than sorry. They seated us promptly and it was not long before our server had come over to greet us and take our drink order. They have an extensive wine list - you are able to order them all by the bottle, or there are certain wines in each category that are available by the glass. We weren't drinking that night - so they also offer Coke products. 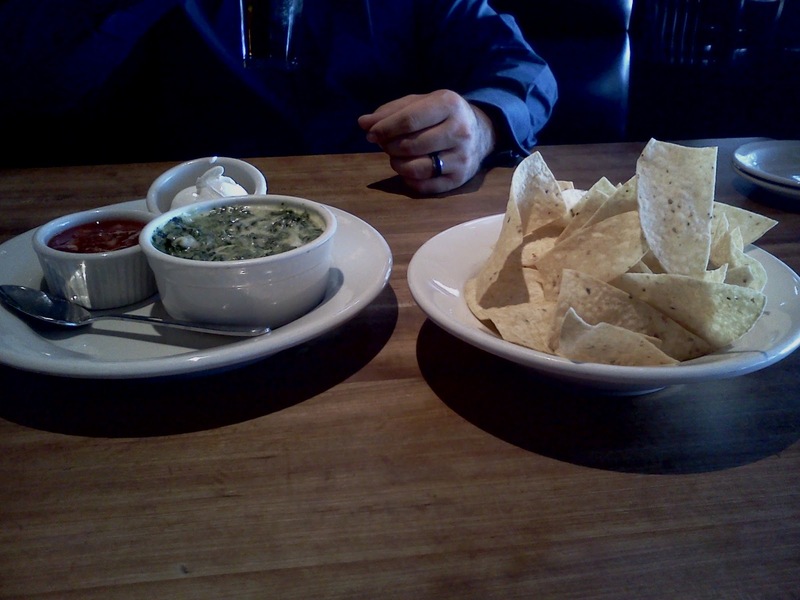 We started with an appetizer - Chicago Style Spinach Dip. Since I was teenage I always graded how good a place was based on their Spinach Dip. Sounds crazy - I know. But I have had some sub par dips in my day (really.. I am not that old lol). This one however - was wonderful. It was creamy, cheese and flavorful. It also came with salsa, sour cream and tortilla chips. After we had gone through our bowl of chips the waitress came with a fresh bowl without us saying a word. This continued through our whole meal. If our drinks were low - fresh one would arrive before we even thought to ask - and it wasn't just our waitress. The whole wait staff seemed to work together for the collective good. Helping take plates away, refilling drinks - it was refreshing to see such a cohesive unit. On to our main courses. The menu is not huge - just one page - but 4-5 courses immediately jumped off the page at me. 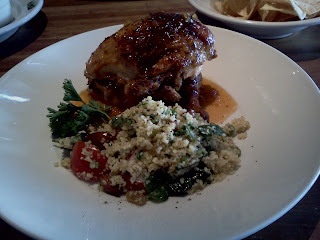 I ended up ordering the Rotisserie Chicken - served with an apricot glaze and couscous. My husband ordered the Roasted Prime Rib (and you know I totally ate off his plate). The chicken came and the presentation was lovely (you eat with your eyes first). It was cooked perfectly with nice thin crispy skin. The glaze was delicious, a little spicier than I expected, but good. The couscous...well that is where we hit our first snag. I was expecting a larger pearl couscous.. and it to be hot. This is a cold couscous salad. The couscous was very small, almost quinoa sized. Personally - I didn't like it. I found the texture unappealing, way too oniony for my taste, and the vinaigrette used seemed bitter to me. I should have known better and asked about it first. But you live..you learn..then you order the salad instead. My husbands Prime Rib was good. It was a large portion and came with shoestring fries. The only negative we both concluded was that the crust on the meat was quite salty. So if you eat a big piece of the outside crust as once - be forewarned. Because we were feeling evil that evening we both decided to order dessert. Normally we share one.. but we both wanted different things so we splurged. I ordered their new Banana Cream Pie and my husband has the Apple Walnut Cobbler. All I have to say...Sweet Baby Jesus, thank you thank you thank you. I have a sweet tooth.. there is not denying it. And this just - OMG - was amazing. First off - it was huge ( I had to take half of it home) And it was a true, made from scratch banana cream pie. The crust was a mixture of graham crackers and nuts I believe - it gave it such amazing texture that I am going to steal the idea for my next graham crust pie. On top of that was a thin layer of chocolate ganache - finished with this vanilla cream custard. 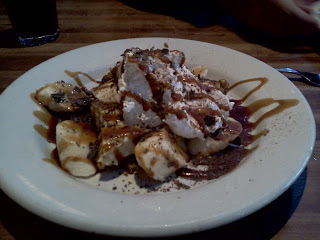 It was topped with fresh bananas (go figure), a homemade caramel sauce, whipped cream and chocolate shavings. Heaven. It was not too sweet... not too heavy.. it was perfect. 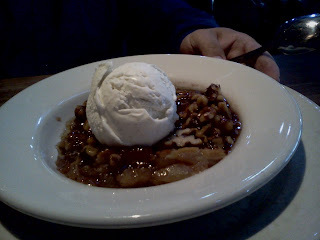 The apple walnut cobbler was also delicious. It was served with the caramel sauce and ice cream. I only stole a small bite - but it was a delicious little morsel - and I worried for a moment my husband might start to lick the bowl clean. All in all the food was delicious - but lets get down to the nitty gritty. The staff - awesome. The ambiance - awesome. The food - minus the couscous salad - awesome. The price - can get pricey! Before tip our bill was just under $90. Granted we did get a huge meal but we didn't have wine. Plus tip - we spent just under $110. It wasn't so bad because we had received a gift card at Christmas - but normally this would be a once in a blue moon, special occasion spot of us. If you are ordering lighter - for lunch perhaps - they do offer lighter, less expensive fair. Even an appetizer would be a wonderful, filling lunch. But if you are going to go all out - it is going to be pricey. On your bill as well they do show you how much it would cost to tip 15%, 17% and 20%. We ended up tipping like 18% and it was worth it. They did a great job. Also so you know - and they state on their menu - They include 18% gratuity on any party of 5 or more. Also notify them of any food allergies and they ask for no cell phones in the dining room ( I was evil and took pictures on mine - but it was on vibrate). Overall, I would, and will go to Hillstones again. I am intrigued to try either the Spinach & Chicken Waldorf (I kept writing Waldork, lol) Salad or the Caesar Salad with the Crispy Rock Shrimp...mmmm.. my mouth is watering already. Make sure to keep an eye out for a future update on Hillstones!